The Aurelia’s efficient use of interior space benefited from Lancia’s long history of innovative chassis design. The company had started work on unit bodies with its seminal patent in 1919, and production of the open Lambda car in the early 1920s, with further improvements being made in the Augusta berlina of 1932. The Aurelia structure clearly fits within this tradition, and its sophisticated floor pan was a development of the rigid structure designed and patented for the Aprilia in 1936. The chassis utilized many subtle solutions, such as a small upturned rear section of the floor pan that stiffened the structure. The Aurelia featured a rear-mounted transmission was combined with the clutch and inboard drum brakes, lessening unsprung weight for even weight distribution for the overall car. Needing only a small tunnel to house the driveshaft to transmit motor power to the rear, interior space was maximized, allowing front seating for three across. The driveshaft was small, but its high rpm made it sensitive to balancing issues. Two kinds of driveshafts were provided - the earlier type relied on a small diameter tube, with splined ends, fitted to aluminum paddles which connected to rubber discs. 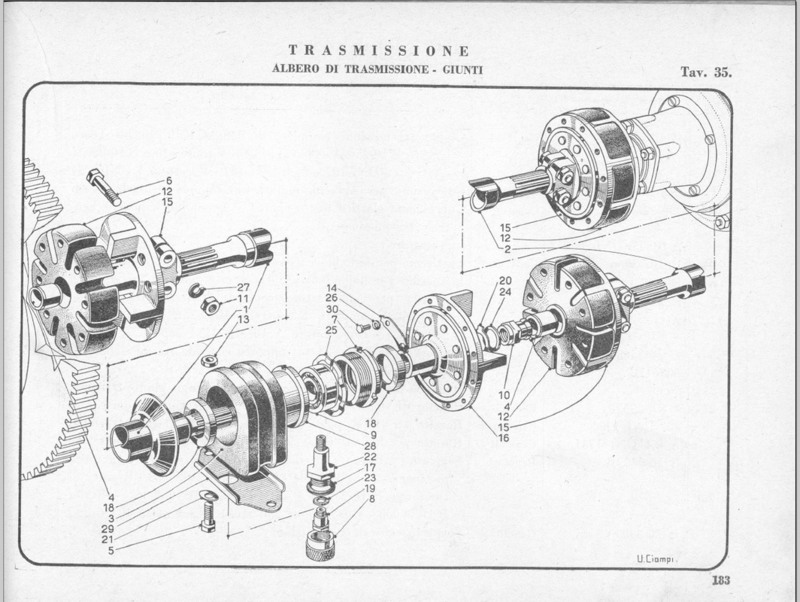 There were two shafts, connected at either end to the engine and clutch, joined at a central bearing. The bearing floated, achieving its alignment at speed (important this). The earlier shafts are sensitive to alignment. The later cars (5th s. on) used a heavier tube, connected with hexagonal rubber spiders. More robust, this design was also used in the Flaminia and in the Alfa GTV6 in the 1970s-80s. While the later shaft likely has less vibration, there remains something pleasing about the earlier setup, when properly done with their lower moment of inertia, and crisper shifting.